With this, we would like to announce the complete recall of selected 2017 SCULTURA forks to ensure the safety of our customers. We deeply regret this recall but the safety of our customers is our main priority. Selected models of the carbon fork might break under stress and could cause crashes, serious injuries and even death. It is ESSENTIAL that the fork will be replaced and the bike should not be continued to be ridden or used under any circumstance. On the aforementioned models, the carbon steerer of the forks is not able to withstand the stresses and strains it will be exposed to. Under intensive use, the steerer underneath the clamp of the stem and spacers can develop fractures which can lead to a complete collapse of the fork. To ensure the safety of your customers we have put together this complete recall of the affected forks. IMPORTANT: Further riding or other usage of the bikes which carry the affected forks is to be stopped immediately until the replacement fork has been fitted. If the fork is continued to be used it can break and therefore cause injury or even death. The replacement is of huge importance before any further use of the affected models. If you ride any of the aforementioned models, please stop using your bike immediately and get in touch with the MERIDA dealer you bought your bike from. If you are unsure please get in touch with your MERIDA dealer to check if your bike is also affected. In conjunction with our dealers, we are running a replacement scheme for the affected forks. Currently, we are expecting that the first forks will arrive around the middle/end of August. Any further updates will be published here. How can you see if your fork is affected? The affected forks are limited to two model numbers and one production code. The details can be found on a sticker with QR-code that is visible when the stem is removed and the fork has been taken out of the frame. Only forks with either of the two model numbers as well as the production code are affected. If there is a different number on the sticker on your MERIDA carbon fork steerer than the fork is not affected and has passed all safety tests. To determine at a later date if one of a replacement forks have been fitted, there will be a clear identification on the fork. Further details regarding its identification will be published at a later date. Even with the fork-stem being one of the most safety relevant parts of the bicycle, as a failing will cause losing control of the bike and can have serious consequences for the rider, there is no international test-standard (such as ISO 4210) which includes proving the fork-stem’s durability under the forces introduced by the handlebar! Just the lower part of the front-fork is covered by legal standards within defined testing programs. MERIDA as an extremely safety conscious manufacturer runs external lab-tests of the fork-stem at the beginning of a new fork model being produced to certify the construction and the manufacturing process to be safe. Our SCULTURA CF2 fork went through the test program and got homologation of high-level product safety. After we had reports of three cracked SCULTURA CF2 fork-stems from an Italian amateur road-team, MERIDA R&D started immediate investigations: Following a safety check at the other team-bikes, we found several of them showing the beginning of fractures. As a direct consequence, we passed a bigger number of identical forks to a leading independent test-lab in Germany. The result was that these forks were not fit for purpose. After intense discussions with MERIDA’s manufacturing partner, we learned that despite regular checks an irregularity had occurred in the production process, which has a detrimental effect on the strength of the fork and therefore on the safety of our customers. To ensure the safety of our customers we immediately decided to recall the affected forks. The new replacement fork has the originally set strength and has passed the most demanding safety tests. Are full carbon forks dangerous? No, carbon front forks are not dangerous items. With the right design, consistent manufacturing, stable QC and careful treatment by mechanics no other material offers the same package of lightweight, high durability and long life-span. MERIDA can further underline that no other material than carbon fibre offers the same package of lightweight, high durability and long life-span. However, it has to be made clear to everyone that incorrect treatment (carbon material is torque sensitive) and parts combinations (many available h-bar stems designs with open rear-clamps, big internal windows and sharp edges are not carbon fork-stems friendly) can impact the life-span of full carbon-forks. As one of the biggest bicycle manufacturers in the world, MERIDA is fully aware of its responsibility towards its customers. The reason for this recall was neither foreseeable or actively avoidable. By surpassing any officially require level of testing we determined the shortcoming of our forks. 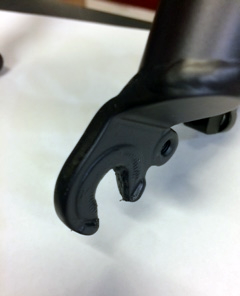 It is hugely regrettable that our customers will not be able to use the affected models before the forks are replaced. As cycling fans ourselves, we are aware how important time on the bike is for our customers and we are going to do our utmost to rectify this situation as soon as possible. We would like to apologise in advance for the inconvenience this will cause. MERIDA Speeder 20 Disc bicycles sold nation-wide between August 2016 and February 2017. If the defect occurs whilst the bicycle is in use, serious injury or death can occur. Consumers should stop using the bicycle immediately and contact their local MERIDA retailer to inspect the fork and if necessary have a replacement fork fitted or to receive a full refund of the purchase price. The MERIDA MTB Expert handlebars may bend or weaken after heavy landing from jumps and drop offs. In time this could result in the handlebar breaking. Consumers should stop using the bicycle immediately and contact their local MERIDA retailer to have a replacement MERIDA MTB Expert II handlebar fitted. Contact Advance Traders on 1300 361 686 or visit www.advancetraders.com.au. A copy of the recall notice is available online here for your information. MERIDA S-Presso bicycles sold nation-wide between 2008 and 2013 including those bicycles that have been fitted with a replacement fork during a previous recall. In some circumstances, the fork may loosen at the connection between the form crown and the fork leg. Consumers should stop using the bicycle immediately and contact their local MERIDA dealer to have a replacement fork fitted.